Victon Wants You to Gaze Into Their "Eyez Eyez"
Merely four months after their debut, Victon has made a return with the song “Eyez Eyez”. 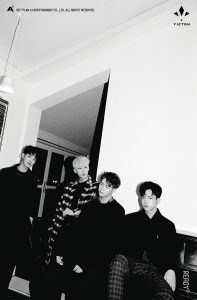 Their last title track “I’m Fine,” was light-hearted and fun but the group takes a 180 degree turn to a grittier image and sound this time around. “Eyez Eyez” goes for the more hip hop, bass heavy, dance style that is popular among boy groups. The style change, for me, is a plus. The market has been saturated with debuts and rookies lately and the cutesy shtick only works if you can do it extremely well. Or, like Seventeen or NCT Dream, you have the younger members that make it work. 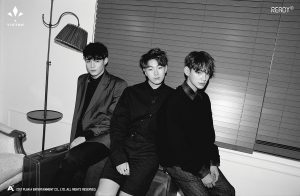 Victon is slightly older, so the more mature look and theme goes better with their age. They seem to really fit the genre as well. What’s one of the biggest relationship no-no’s you can think of? Being on your phone ignoring me when we’re supposed to be spending time together is one that’s pretty high up on my list. This song is all about that: Look into my eyes. The guy wants to be more of a priority instead of being put on the back burner even when he’s right in front of his girlfriend. The whole premise is respect: Look me in my eyes and either tell me we’re through or commit to us. And don’t try to be cute to get out of it or pretend to be hurt (“I didn’t scold you / Stop putting on that scary frown”) because I’m giving you this ultimatum. There’s a lack of story in the MV for “Eyez Eyez” which, considering the lyrics, is a missed opportunity. Though I can see what Plan A was going for with the type of video and the visuals, the overall impression is just lacking. Smoldering glances interrupted by too-short dance sequences is a rookie move. Victon may be a rookie group, but the company has had major success with their girl group, A Pink, and should know better. The video isn’t engaging enough to warrant multiple watches, unlike, say, Twice or BTS who’ve recently broken records with their latest MVs. There are random prop shots towards the end of the video that don’t tie into the theme, the lyrics, or anything else at all. It was as though someone didn’t want to add in any more dance sequences so they threw a shot of a scale in there for some fun. I can’t make this stuff up. I can’t. And while this isn’t a new phenomenon is K-pop in the slightest, I have to wonder what the writers and company were thinking when they included lines like this. I was jamming to this song that I was admittedly apprehensive about initially, but deflated when I heard the random English phrases. The ending sounded as though it went on five seconds too long, and that really threw me off. But it is important to take into consideration that this is only the group’s second outing. The song and video are lacking in some respects, but they’re still experimenting with finding a sound and niche. The dance sequences of the video were good, and Seungwoo and Chan were the standouts for me. What Victon needs going forward is to marry their performance skills with a concept that allows them to really go all out.